White ink tattoos are a great example of how body art is becoming more unique. These interesting tats are much different than your traditional tattoo. Knowing the differences with this type of tat and considering possible designs can help you decide if it's right for you. White ink tattoos do not follow the usual tattoo process of stenciling and outlining in black. Instead, the tattoo itself is completely done with white ink, leaving a ghostly image that looks quite different from a traditional tattoo. These tattoos can look like brands (or scarification), or they can appear to be very subtle. This can be a good alternative for someone who wants a tattoo but can't have obvious body art in their work environment. 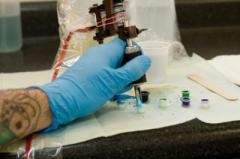 The white ink used for tattoos is not the same ink you might have seen used for mixing shades in a color tat. Instead, it is a thicker, high quality white ink that is specially made to stand out on its own. A stencil can be used with a white ink tat, or the tattoo can be done freehand. If a stencil is used, the artist must be careful to make sure the ink from the stencil does not mix with the white ink being used - this can dull the brightness of the ink. Also, white tattoos can require several passes over the area to make sure the white ink sinks fully into the skin. White is not as likely to be absorbed by skin as black or colored inks. Some individuals may also find they have a reaction to the white ink. This is much more common than a reaction to black tattoo ink. In some cases, the white ink areas swell, itch and may even ooze from the tattoo. This can be a sign that your skin is actually rejecting the white ink, and you may end up with no tattoo in that area as a result. Another issue with white tattoos is that they are not ideal for areas of the body that will be exposed to the sun and weather elements. Harsh household chemicals can also damage a white tat. White ink can turn quite dull if frequently exposed to the sun, so it's important to choose an area that will be covered when outdoors such as your chest, back or even the underside of your arm. White ink is not a good idea for hand tattoos or tats in other exposed places. What sort of tattoo looks good in white ink? Simple designs are easier for the artist to ink and less likely to have complications. Feminine designs look great in white and appeal to women of all ages and backgrounds. Since tattoos are permanent, choose wisely and think about your decision until you are completely confident with your choice. Lindsay Lohan is one celebrity who wears a small white ink tat on the inside of her wrist that says Breathe. Another celebrity who has a tattoo done in white is Kate Moss. Her tattoo is a series of white hearts running up the side of her body. Getting a white-colored tattoo can be a good way to have a tattoo that's special to you. Since they are not easy to spot, they will most likely only be seen by those that you show. This meaningful tat can be a statement of your personal mantra, or simply reflect your unique personality.